The Strange Case of Dr. Jekyll and Mr. Hyde by Robert Louis Stevenson <~~ My spooooooky Halloween read! I have MaddAddam on my shelf. I requested the first two books of the trilogy from my local library. I hope they come in soon! I could watch this gif all day. Happy Halloween my lovelies! I've been really interested in that Coming Clean book - I'm a little fascinated by hoarding and think I would love it. Can't wait to see what you think! I don't know how I got onto it, but I've been reading up on Oscar Wilde on Wikipedia the past few days, so I'm anxious to know what you think of the book you're currently reading! I hope you like it Monika! I have The Family, too, and need to get around to reading it. The book about Oscar Wilde looks interesting, and I have to read something more by Atwood; I read Cat's eye time ago and I liked it. 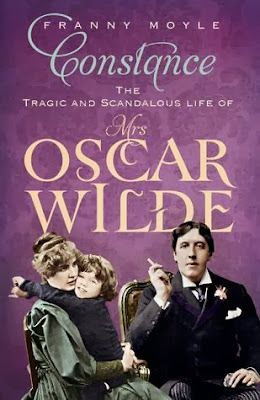 Oooo the Oscar Wilde's wife book looks interesting. He seemed like a weird guy, so I can only imagine how her story must go. He was something else wasn't he? His wife was too! It was a very interesting read. Looks like you're on an Atwood reading marathon. I don't think I've read any of her books. Enjoy your reading week! lol that gif is funny yet scary. Gorgeous covers on those Atwood books! And the Wilde book looks good too. Happy Sunday. Omg that gif is so funny hahah. And how ru liking Dr. Jekyll & Mr. Hyde? I love that book, it's so short and creepy! I am so glad that I finally got around to Jekyll & Hyde! Short and super creepy!! Thanks Dee, same to you! I'm going old school for my Halloween read too, but only into the 1940s. You're into the classics. A coworker said she's reading Washington Irving's The Legend of Sleepy Hollow, which I've read, but it's been a while so maybe I'll tackle that too. Oooh, I'd like to read Sleepy Hollow as well! I never have! I don't know why, but I find that gif at the end super creepy!! I really did enjoy Jekyll and Hyde! It was short and spooky, exactly what I was looking for. I'd really like to read Sleepy Hollow as well! I enjoyed the first two in the Margaret Atwood series, but I haven't gotten the third yet. :) They are kind of sci-fi dystopian, pretty different from most things I read, but I still really liked them. My husband did too. :) Have a great week! They are really different for me too! I really want to get going on them but the library hold isn't coming in and wahhhh! Hope you enjoy the Atwood! Reading books of the same author one after the other is one of those things often lost as a blogger. Oooh ... Oryx & Crake! I would love to read the rest of the trilogy, but the first book terrified me. I hope you enjoy it! I'm waiting for Oryx and Crake to GET HERE! I'm not a patient person, lol. Hmph! I hope I enjoy them too, thanks! Dr Jekyll and Mr. Hyde is a perfect read for the Halloween. I'm still figuring mine out. Constance seems very interesting. I love a good literary biography! It was a great read Lindsey. Very interesting!! I need to read Year of the Flood soon. Hope I remember enough of O&C to 'get' it. Oh, I'll just tweet you a question if I need to remember something, ok?! I hope O&C gets here soon dammit. I want to read it and I'm just a'waiting for my library hold to come in. LOL, go ahead! Woo! Maddaddam trilogy! I loved those books. I hope I do too! !